Natalia Olejnik-Fehér, NaMeS PhD student, paricipated in the secondment to the Institute for Nanoscience and Cryogenics, Grenoble. The main goals of her project are: (i) systematic investigations on surface characterization as well as density and distribution of organic ligands and/or inorganic functional groups on the surface of bare and ligand-coated ZnO NCs with applications of various analytical techniques (i.e. TEM, PXRD, DLS, UV-vis, PL, EPR, FTIR, TGA) with emphasis on high-field solid-state magic angle spinning dynamic nuclear polarization (MAS-DNP) ehnanced NMR spectroscopy, and (ii) elucidation of the dependence of the surface chemical character on physicochemical properties of studied ZnO NCs. ZnO-based nanomaterials that Natalia have taken to her Secondment in Grenoble, have been obtained via original OSSOM (One-pot Self-Supporting OrganoMetallic) methods, enabling strict control over size and shape of the formed ZnO NCs. During the course of the Secondments she was able to realize three projects. First, Natalia started with an attempt to perform 17O NMR on the samples she have prepared for this trip. Samples included bare and hexanamide capped ZnO nanocrystals that had been enriched with 17O either on synthesis stage or by high-energy ball milling. This project was the focal point of her Secondments. Note, that 17O is a particularly difficult nucleus to observe with NMR spectroscopy. However, the information that was obtained, both on the ZnO bulk, ZnO surface, and the organic ligand shell, brought her closer to understanding the structure of the nanocrystal-ligand interface of ZnO NCs prepared by the OSSOM method. The second and third projects were as well based on different type of ZnO materials, but samples were provided by colleagues from IPC PAS and Warsaw University of Technology (WUT). 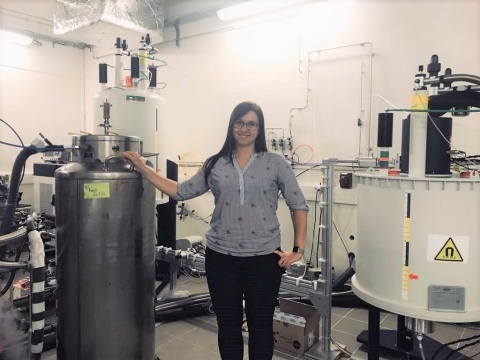 Nevertheless, participation in these projects allowed her to build experience as an NMR spectroscopist either by providing an opportunity to work with new nuclei or by bringing in new perspectives to look at her main project.